It seems that Gigabyte is getting more serious in trying to get more of the mining market share for motherboards after they have left AsRock to dominate the mining motherboard market for a long time. They even lost positions to their main competitor – Asus and many other smaller manufacturers that entered the mining market. Gigabyte has been trying to get back on track with the last year’s release of the affordable Gigabyte GA-H110-D3A 6x PCI-E GPU Mining Motherboard and now it seems the company is also targeting the market for more than 6/8/9 GPUs on a single motherboard as well with their new Gigabyte GA-B250-FinTech motherboard for up to 12 video cards. The new mining motherboard is based on the Intel B250 Express Chipset and is meant for use with Intel LGA1151 processors and DDR4 system memory. It comes with DSUB and DVI video outputs for the built in Intel graphics inside the CPU and there are two extra onboard 4-pin Molex power connectors for use if you don’t rely on powered PCI-E risers (not a very wise idea for 12 video cards), so you may skip them and just stick with powered risers. The rest is pretty standard configuration, though we should note that the motherboard does not seem to have an M.2 slot, so no option for extra 13th GPU or the ability to use an M.2 SSD drive and cut on extra cables. 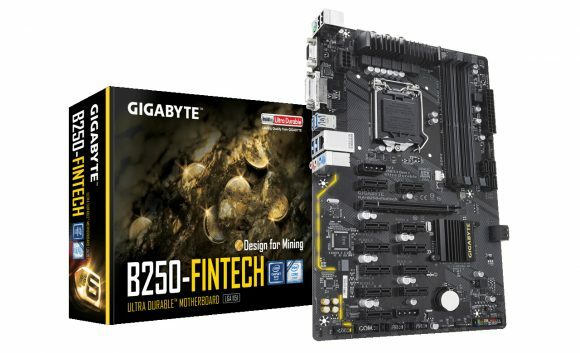 The key selling point for Gigabyte with their GA-B250-FinTech 12x PCI-E mining motherboard is the cost savings you get when you use 12 video cards on a single board compared to two rigs with 6 cards each. While this is true, it is also worthwhile noting that 12 GPU mining rigs are larger and harder to maintain and support in case of trouble such as failed cheap Gigabyte Windforce fans for example. Gigabyte is providing the so called Mining Kit with the GA-B250-FinTech motherboard that consists of a Front Panel Switch Card that comes with Power and Reset buttons. While this seems usable and convenient, it is actually not that functional as the board plugs into the Front Panel connector on the motherboard, so it will most likely still end under a GPU or near a PSU and it will not be very convenient for use. Getting a power button or even a power and reset button would be useful if they are with a decent length cable and you get the ability to position the button(s) in a convenient position on your rig. There are number of different mining rig designs, so adding useful flexibility with a power and/or reset buttons might be really useful, but not that much in the case of the Gigabyte Front Panel Switch Card. Sometimes one would think that these companies just don’t know what they are doing with their products, but then again they can always ask for help and support some miners to give them advice on what and how to do. The other piece of hardware, if we can call it like that, that you get with the mining motherboard as a part of the Mining Kit is the 3-in-1 PSU Power-On Adapter. It is essentially a cable that allows you to power on one or two extra PSUs as soon as the main power supply turns on and this one is actually useful to have, especially if you build 12x GPU mining rig as you will most likely need more connectors than a single or even two power supplies can provide (depending on the GPUs you are using of course). So good job on this one Gigabyte, but you still might want to rethink the idea you have for the front panel switch card or actually make it more useful and functional for a wider number of users. 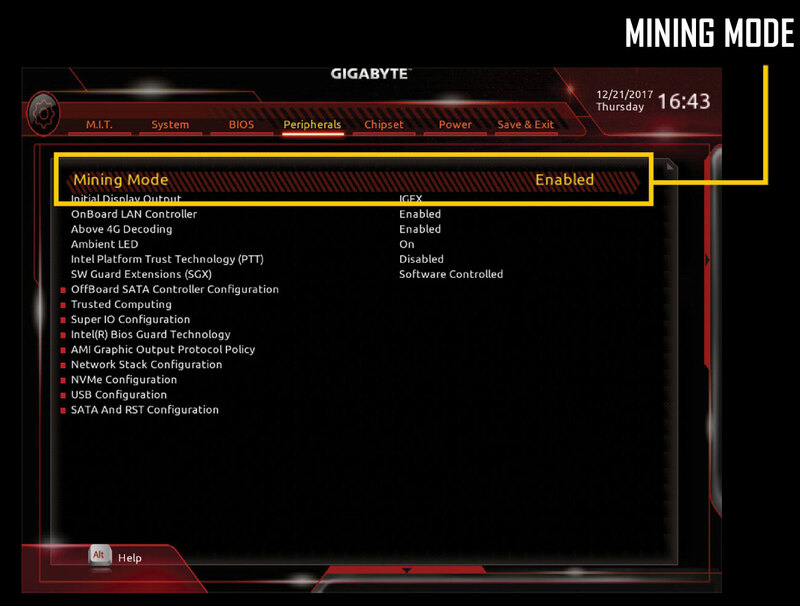 The last probably useful feature in the new Gigabyte GA-B250-FinTech motherboard for miners is the Mining Mode in the BIOS. A setting that should in theory make it easier for miners to setup the motherboard for use in mining rigs without having trouble when using more video cards, up to 12, though you can still use this motherboard with a smaller number of GPUs as well. 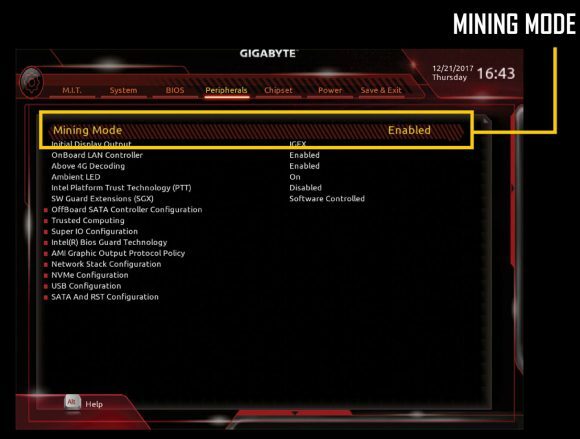 The Mining Mode in BIOS has been available for a while on some Gigabyte motherboards that were not designed especially as mining motherboards, but have been proven to work well as such, so it is nothing that new anyway. People that have used Gigabyte motherboards for building mining rigs are probably already familiar with using that mode in the BIOS.